When I was a kid, we were allowed Hostess Cupcakes as a rare treat. The first thing I’d do is pick off the white swirls. Then I’d eat the frosting. I’d then split it open and scoop out the yummy cream filling. Lastly, I would eat the cake. Not much has changed, if I had one now, I’d eat it the same way. 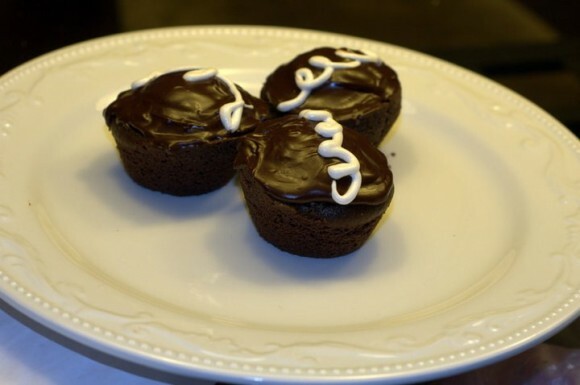 Our friend, Rick, makes a great Chocolate Cream Cupcake similar to that childhood treat. Thanks Rick for sharing your cupcake recipe with us for Tide You Over Tuesday! These cupcakes are hands down the best I’ve ever tasted (of their type); though that could be because Charlotte & I made them together, and it felt so good eating them. They certainly do beat the original hostess cupcake though. Just be prepared for some serious temptations for the next 2 days while they sit around. We usually give away as many cupcakes as we can right away, so we’re limited from the start. But giving these things away is really really tough for us. *To ensure the correct consistency of the filling, use marshmallow creme (fluff or Kraft Jet-Puffed Creme) and not marshmallow sauce. 1. Make batter. Adjust the oven rack to middle position and heat oven to 325 degrees. Grease and flour 12-cup muffin tin. Combine flour, baking soda, and salt in bowl. Whisk water, cocoa, chocolate chips, and espresso in large bowl until smooth. Add sugar, sour cream, oil, eggs, and vanilla and mix until combined. Whisk in flour mixture until incorporated. Divide batter evenly among muffin cups. Bake until toothpick inserted into cupcake comes out with few dry crumbs attached, 18 to 22 minutes. Cool cupcakes in tin 10 minutes, then turn out onto wire rack and cool completely. 2. Prepare filling. Combine water and gelatin in large bowl and let sit until gelatin softens, about 5 minutes. Microwave until mixture is bubbling around edges and gelatin dissolves, about 30 seconds. Stir in butter, vanilla, and salt until combined. Let mixture cool until just warm to touch, about 5 minutes, then whisk in marshmallow creme until smooth; refrigerate until set, about 30 minutes. Transfer 1/3 cup marshmallow mixture to pastry bag fitted with small plain tip; reserve remaining mixture for filling cupcakes. Rick is a stay at home dad to an awesome 3 yr. old. Together they explore, play, & bake. When the schedule allows he’s at the hockey rink pretending to be an NHL player. Rick credits his baking inspiration to Cook’s County. You can find Rick over at rickandsharon.net.